Chart No. 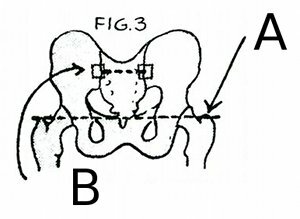 55 - Rotation of Feet and the Correction of the Os Calcis [Calcaneus] Position in Relation to the High and Low Sides of the Hips, and the Entire Back. One hand on one heel and the foot for leverage, and one hand above on the back, neck, or thigh with a rocking motion. This aims to release the inferior block and tension, through the control areas above, namely the superior positive and the neuter [neutral] pole on the back. Correction above is applied where blocks exist thru [through] occipital contact. The leg may be flexed to reach the occiput or back, to inhibit or rock the area. This can be done on either side one at a time with emphasis on the tense short leg side. There is usually a heel soreness and a severe occipital tension found on the short leg side. Sometimes it crosses over from one heel to the opposite occiput. Raised portions of the back also show the muscle pull there, which is released by rocking and heel lineup. This is the polarity way of balancing bad feet by lining them up with gravity and releasing muscular tensions thru [through] the electro magnetic [electromagnetic] circuits of the body. It accomplishes more than mere heel lifts and arch supports aim at. (B) Individual neuter [neutral] balance center to the gravity motion center. A straight line drawn thru [through] the center of each acetabulum gives the weight bearing gravity center of motion in the body. All motor impulses of the body expressed as physical motion, reflect to this center line. The body must maintain a balance between its force of muscular impulses and the center line. The body must maintain a balance between its force of muscular impulses and the center of gravity momentum. This is a high point in therapy and easily achieved by this method of polarizing fields and forces.